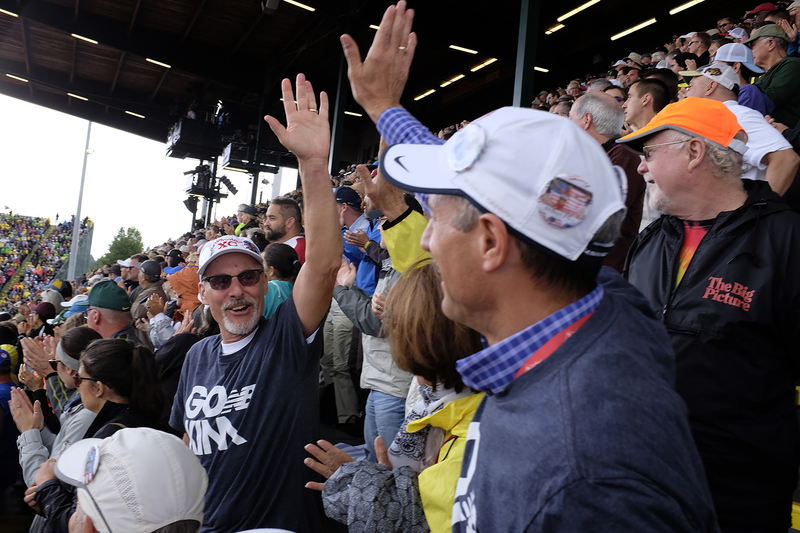 This summer’s Olympic Trials for Track & Field marked the third quadrennial pilgrimage to Eugene for a small group of Empire Runners who consider it a vacation to attend a track meet that goes on for eleven days. The following is a synopsis of our experience from my point of view. 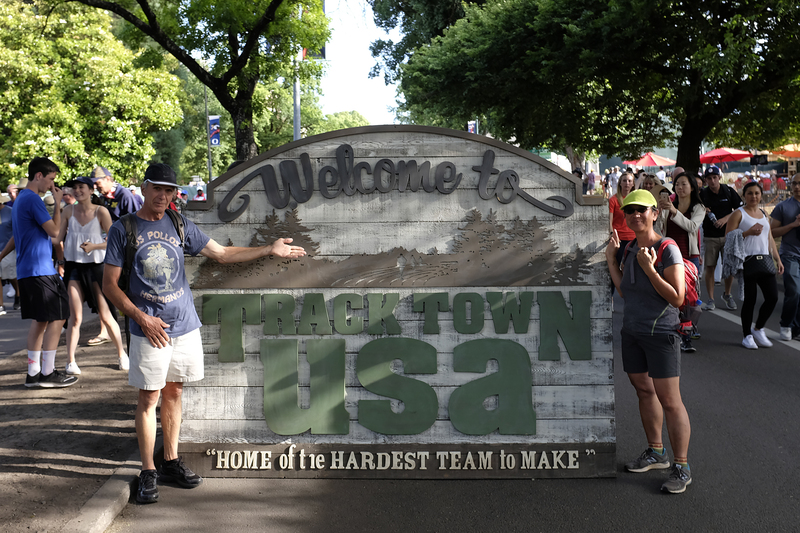 John and Jill Harmon arrived in America’s Tracktown ahead of the pack. That was to be expected. Not only are they the only retirees in our group, those who know John understand that his level of preparation as a spectator may favorably compare to the physical preparation required of the many competitors he came to see. I have bestowed upon him the title of track and field aficionado, which the Oxford dictionary will tell you is “a person who is very knowledgeable and enthusiastic about an activity, subject, or pastime.” They settled in near the University of Oregon track facility, Hayward Field, and appropriately got their Ducks in a row long before the opening event. By the time the rest of us had arrived John and Jill had already discovered the best ice cream shop in the vicinity. I am among those who experience a gag reflex when the subject of race walking is broached. As a friend once enlightened me, this competition generates about the same level of excitement as a contest held to determine who can whisper the loudest. Fortunately for me, I have eschewed most forms of social media so hard line race walk enthusiasts may find it frustrating to lambaste me publicly. Let me just finish this subject off with a final, delicate jab: I found it appropriate that these events were held on Day 0. Club President Paul Berg and his wife, Hilda, pulled into town on Day 0 but it is doubtful that they caught any of the race walk highlights. Their daughter Celeste was a top runner for Montgomery High School years ago and Paul was a welcome contributor of his time and energy to the Viking cross country program. This link to MHS XC was a common theme for many of us at the Trials. 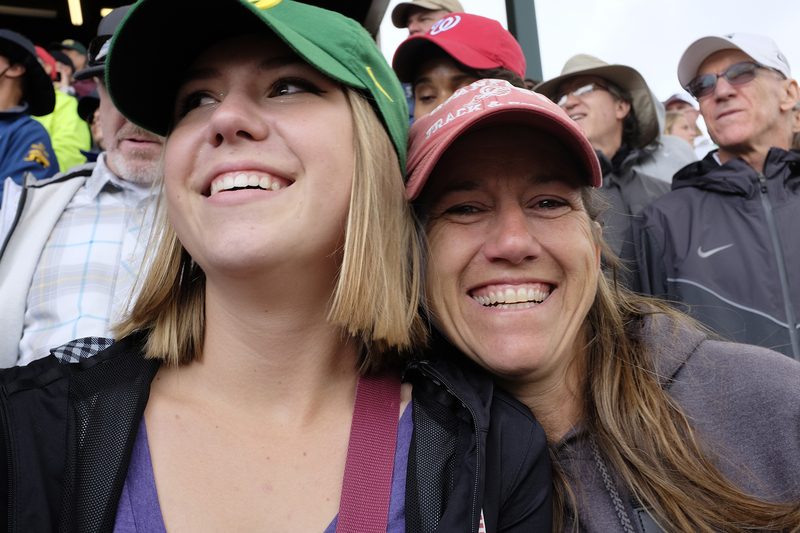 McKenna and mom Val Sell enjoying the trials. I believe Val and McKenna Sell, accompanied by Joey Johnson, arrived on Day 0 but it may have been in the wee hours of Day 1. Though her car was not equipped for off-highway excursions, Val threw caution to the wind by first heading north on Highway 101 and then taking the seldom-used Covelo Cutoff to find her way back to the Great Central Valley of California. It’s safe to say that Joey and McKenna will have a story to tell their grandkids one day. I’m not implying that Joey and McKenna are an item or that they will have grandkids together or even separately or . . . oh, never mind. What I can say is that they are teammates in track and cross country for Sonoma Academy HS and both are quite good distance runners. Val recently gave up the MHS XC head coaching job, a position she held since the fall of 2003. Brad and Bev Zanetti were planning to arrive on Day 0 but Brad pulled off a perfect Zanetti while mountain biking on Canyon Trail just days earlier. The hairpin curve halfway down the trail couldn’t contain Brad and he awoke sometime later with a split helmet and snapped collar bone. Complications that were too complicated for me to comprehend kept Brad from traveling until Day 2. The Zanetti’s had three youngsters compete in cross country for MHS a while back and Brad has been a fixture as a volunteer coach, mentor and along with Bev, a strong team supporter ever since. Brad, Bev, Val, McKenna, Joey, Hilda and Paul were all sharing a house on the south edge of Eugene, just over 2 miles from the stadium. 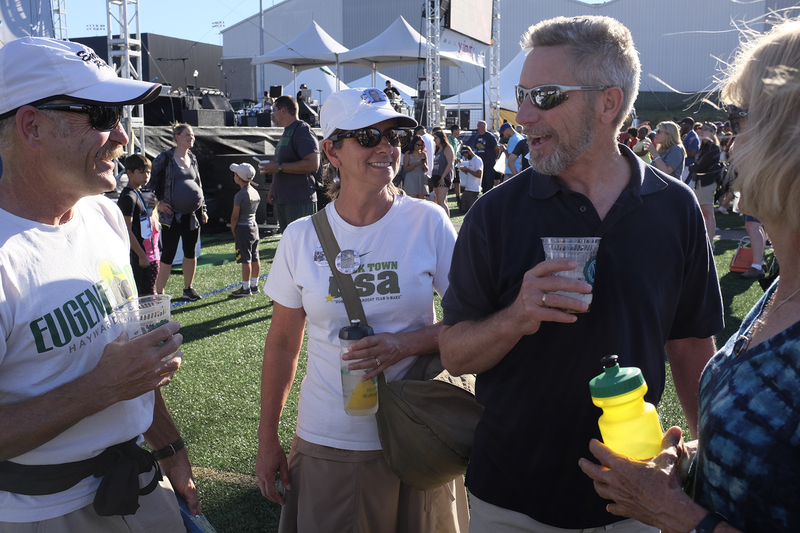 Dale Peterson and Larry Meredith enjoy a beer near the Ninkasi tent as Tori Meredith and Robin Stovall look on. Robin Stovall, Dale Peterson, my wife Tori Meredith and I made the long drive up from Santa Rosa. 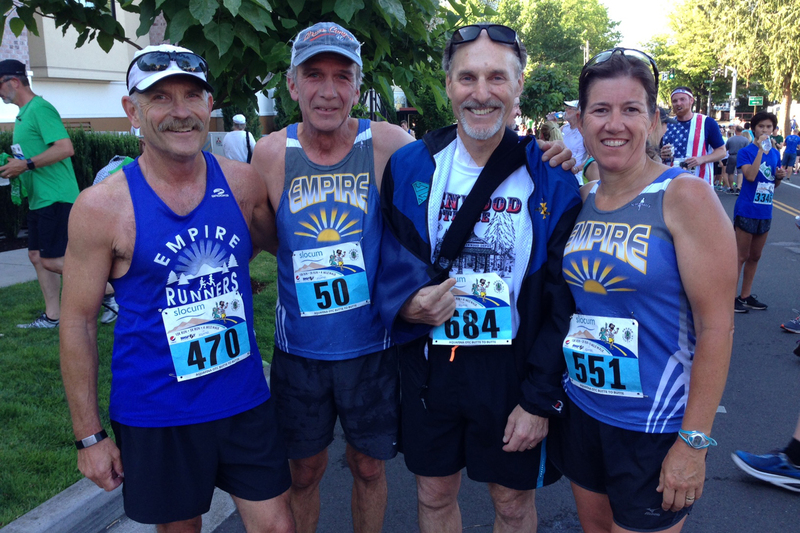 Longtime Empire Runners Robin and Dale have been attending the Trials since they were first held in Sacramento 16 years ago. Tori and I have made the last three trips to Eugene and, in our younger years, coached cross country and track at MHS. This year we four shared a house just a couple of blocks from Val and Co. so get-togethers and carpooling was quite simple. After checking in with the landlady we straddled our bicycles and headed for the track. Although we took a short detour through an old graveyard just west of the stadium, we made it in time to see some preliminary 400-meter races and before long it was time for the first track final of the Trials, the men’s 10,000 meters. To put it mildly, it was an odd race. Local favorite Galen Rupp, a former Duck and silver medalist at the 2012 London Games, had already made the U.S. team by winning the marathon trials back in February. It was his debut marathon and he made it look effortless. Rupp was the odds-on favorite in this event and, after a few laps at a relatively pedestrian pace, he put on a burst of speed to suddenly pull 25 meters ahead of the pack. I’ve never seen a favorite do this so early in a Trials distance race. I wondered if he was simply using this event as a training run for his marathon in Rio. No one followed Rupp, which was odd because there were many in the field who needed to run a fast pace to make the Olympic qualifying standard. After running five laps alone, Rupp seemed to get bored with it all and allowed the pack to come back to him. Then he spent a few laps in apparent negotiations with his fellow competitors, trying to find out if anyone wanted to turn this into a real race. At the halfway mark Rupp struck again, accelerating away like a greyhound leaving behind a pack of beagles. This time he found accomplices in Shadrack Chipchirchir, a U.S. Army runner who looked to be about half the height of the lanky Oregonian, and 41-year-old former Olympic and World Champion Bernard Lagat. A trio of chase runners led by another Army runner, Ben Korir, along with Hassan Mead and veteran Ben True eventually tried to join them near the front but another surge by Rupp gave the lead trio a seemingly comfortable cushion three-quarters of the way through the race. As much as Rupp was a local favorite, Lagat was a stadium-wide favorite and this crowd was getting excited about seeing a masters runner take his place on yet another Olympic team. And that’s when Lagat simply stopped and walked off the track. I can only assume that, at his advanced age, he lost count of his laps. Been there. It was Rupp and Chipchirchir for the remaining laps. When Chipchirchir decided to go for the win just before the bell rang out, Rupp once again displayed his dominance by blazing a 60.7-second final circuit, more than six seconds faster than his would-be rival. Impressive. Most in our group then headed over to Turtles Bar & Grill where I had the best chicken sandwich of my life. And I’ve had quite a few. We enjoyed a few ales and discussed what we had just seen on the track. This was the day our group had been waiting for since May, which is when we found out that our favorite runner, Kim Conley, would compete in the 10,000 meters here. Kim is a former Montgomery High School runner. She was a freshman there when Tori and I coached our final season for the Vikings in 2000 and she was a senior when Val took over as head coach in 2003. After surviving three different head coaches in high school Kim moved on to UC Davis where she would, once again, race her way through three different coaches in five years. Apparently none of us was capable of ruining her because she just kept getting better. Even the cruel track gods could not stop this young woman when they twice cheated her out of competing on the national stage in college. As a junior in the regional qualifying meet a fellow runner stepped on her heel and ripped her shoe off early in the 5000. A year later she was poised to make nationals again when food poisoning took her down on the eve of her qualifying race. Though never on the radar nationally, Kim made a bold choice to pursue a career in running. Lucky for her that her current coach, Drew Wartenburg, was her final college coach and his support and guidance helped make possible all of the remarkable achievements that followed. Kim burst onto the national scene at the 2012 Olympic Trials in Eugene. I remember it like it was yesterday and, when I go over the details in my mind, my skin still radiates with goose bumps. Kim’s comeback in the 5000 that day is far and away the most amazing thing I’ve ever witnessed on the track. How she led the race for most of the first two miles because, first and foremost, she had to get the Olympic standard of 15:20. How hope seemed to fade as that goal slipped away by about one second per lap. How the pack swallowed her up with a mile to go. How Julia Lucas decided to put her stamp on this event by speeding into the lead with 1300 meters still to run. How the crowd of runners dispersed into a line immediately after as the pace went into high gear. How Kim faded to eighth place with just 600 meters to go. How she steadily regained fifth place by the start of the final lap. How, with but 200 meters left to run she was still 10 meters behind the fourth-place runner, Dartmouth youngster Abby D’Agostino and a full 35 meters behind the final qualifying spot, held by a badly fading Julia Lucas. How the final straightaway seemed like a dream, Kim passing D’Agostino just meters from the line and then out-leaning a nearly walking Lucas to take third by 0.04 seconds. How we waited to see if the impossible had just happened and then jumped and cried when the big screen posted Kim’s time. 15:19.79. Goose bumps. She followed up the London Olympics by making it to the finals of the 5000 meters at the 2013 World Championships in Moscow, Russia. She was a runner-up in our national cross country championships and competed for the U.S. at the world championships in that sport. In 2014 Kim thrilled her fans in her adopted hometown of Sacramento by winning in dramatic fashion the 10,000 meters at the U.S. National Championship meet. A few months later she was crowned national champion in the half marathon in Houston. Shortly after that an injury, the first serious setback of her career, nearly wiped out her entire 2015 season. But she wasn’t finished yet. Kim and Drew married in 2015 as Kim was on the long road to recovery in their training haven of Flagstaff, Arizona. Shortly after that Kim’s father, Dave, became gravely ill and did not last until Christmas. Several of us Conley followers traveled to Sacramento in late December to watch Kim begin her march to the Olympic Trials with a sub-32-minute 10,000 win under the lights at the Sacramento State track. She ran the 5000 a few times during the spring, threating her 15:09 PR on each occasion, but never getting that breakthrough performance she sought. In Kim’s final tune-up, a 5000 at Portland’s twilight series against strong competition, she followed along with the pack until 900 meters remained. Her surge into the lead that night went unchallenged and gave me the impression that she was ready for something special. Unfortunately for all of the women’s 10,000 runners in the field at the Trials, the race was being held at 11:00 in the morning and the weather was muggy, too hot for comfort. No one wanted to lead this race so they left it up to Molly Huddle, the national record holder for 5000 meters and heavy race favorite, to pull everyone around, lap after lap. Tori had our group cheering in unison each time Kim came down the homestretch above which we were seated about 60 meters from the finish line. Kim was running on the outside of a bunched-up pack as they approached the end of the ninth lap of this 25-lap race. Looking oh so comfortable. That’s when the track gods, who had been so kind to her for four years now, turned evil again. Right in front of us we saw Kim stumble slightly and turn her head back in anger at one of her pursuers. Then she stopped and we could see that she was trying desperately to get the heel of her shoe back on her foot. She couldn’t do it right away so she ended up sitting down on the track to finish the job. By the time she jumped up she had lost a full nine seconds to the leaders. In the stands our group went silent with shock. To have four years’ worth of work be swept away with a simple misstep that was no fault of your own seemed incredibly unfair. Now there was still a long way to run and not much time to make a decision. Kim still had a slot in the first round of the 5000 meters which would be held five days later. Does she drop out right now and save herself for Thursday? She decided to try to get back in the race. Over the next lap the pack remained at a comfortable pace and Kim, in her adrenaline-spiked condition, cut the gap in half. She knew she had to regain contact with the field before the pace heated up. And then the pace began to simmer. Kim gamely came on, catching the stragglers one-by-one, moving from 13th place all the way up to sixth by the end of the 19th lap. There was a moment that we started to believe that she could work her magic again, in an even more spectacular fashion than four years ago. But the front-runners were really moving by then and although Kim had come within three seconds of the lead, her 10th-lap spurt had left her drained. She soon found herself 12 seconds behind and losing places so, in a move that was hardly noticed by anyone but her ardent followers, she sped down the straightaway of her 20th lap, veering gradually to the outside lanes and kept running all the way to the locker rooms under the stadium. A classic exit, if there ever was one. Our group was stunned and I fought back tears, wondering what must be going through Kim’s mind. About 20 minutes later that question was answered for us. Kim sent a text to Val, asking her to tell everyone that she was OK and looking forward to taking on the 5000. Thanking us for our support. How could anyone not admire that kid? For me, the rest of the day was just a blur of qualifying rounds in races I can’t remember. Later we gathered at the Sell/Zanetti/Berg house for a BBQ and the mood was somewhat subdued. Well, at least until we finished off our first beer of the evening. The weather turned cooler a little too late for the 10,000-meter runners. On this day U.S. track royalty extended their reign in several events. Crowd favorite Allyson Felix was a 400-meter winner once again as was LaShawn Merritt on the men’s side. An aging Justin Gatlin was still the fastest human in our nation, covering 100 meters in a mere 9.8 seconds. The women’s 100 saw a coup when former Duck sprinter English Gardner led an entire list of new names for this event. Ashton Eaton finished the day off by defending his decathlon crown. Oh, and somebody won the long jump. Independence Day and we were not in Kenwood! But Eugene has its own version in the Butte-to-Butte run so several of us took it on. John Harmon claimed gold among 60-year-olds in the 5K! Tori and I were entered in the 10K but hampered by injury so we decided to walk it. That lasted about a half-mile. Bored, we began jogging up the big hill on the course and didn’t stop until we reached 4.5 miles. After another half-mile of walking we jogged it in to find our comrades waiting. Butte to Butte 10K finishers Dale Peterson, Paul Berg and Val Sell gather with head “cheerleader” Brad Zanetti after the race. As for the Trials on the track, both genders faced finals in the 800 meters. Alysia Montano, as expected, led the women through about 650 meters before most of the pack re-grouped around her and started leaving her behind. Brenda Martinez was starting her patented kick to the finish, halfway around the final turn, when things suddenly got ugly. Martinez was thrown off balance on the outside, fell right in front of a surging Montano and, just like that, two of America’s top 800 runners of all time were staring at the back of a sprinting pack as it disappeared in the distance. Others in the pack were affected as well, all but newcomer Kate Grace, who must have felt that she suddenly emerged from a maze with a clear path to the cheese. Kim’s husband and coach Drew had apparently made peace with the track gods because he is also the coach of Grace and he watched in pure joy as she held off all pursuers to the finish. While Martinez arose and finished as hard as she could, knowing that she still had a 1500-meter event to try for, Montano was probably experiencing the loss of her last Olympic dream. She jogged the turn and fell to her knees in anguish, crying to the heavens. This she repeated every 25 meters down the homestretch as some in the crowd politely clapped in sympathy. I will leave it to each individual spectator to judge the appropriateness of this display. Montano was later pilloried on social media and in blogs for sharing her suffering so demonstrably. I can’t say that I was comfortable watching it. The men’s 800 was far less dramatic but every bit as exciting. Newcomers ruled the day as Clayton Murphy ran down the heavy favorite Boris Berian in the final meters to take the gold. Berian will likely be a medal contender in Rio so he has a chance at redemption. The beginning of two days off for all the competitors, unless you count the hammer throwers. Which I do, by the way. I may be willing to rile up the race walkers with some snide remarks but who am I to ridicule the nation’s most agile strongmen? The Sells, the Bergs, the Zanettis – all had relatives living in the Portland area so off they went on a road trip to the north. The rest of us gathered a few miles south in Cottage Grove where John and Jill showed off their brand new collapsible tandem bicycle in a yellow color as bright as any shirt John has ever worn. We repeated a 25-mile ride we took four years earlier. The route is a nearly flat, completely traffic-free paved path that passes by farmland, a great reservoir and quiet forest with a few covered bridges to be seen along the way. As we pulled into the parking lot we ran into Kim’s mom, Melanie, and sister, Emma, out for a stroll. Melanie, a Brit with a wonderful English accent, was displaying her stiff upper lip about Kim’s fate in the 10,000. No worries, there’s still the 5000! Robin, Tori, Dale and I drove about 90 minutes west into the coastal range of mountains for some hiking. We found a glorious trail in the deep woods, following a lively stream that was punctuated with spectacular waterfalls. We had the place all to ourselves for a while. John and Jill remained in Eugene and late that evening John participated in a series of public mile races on the famous track, after the hammer throwers had done their damage, of course. Thursday was finally here after what seemed like weeks since Kim’s initial race. The only final on the track this day was the women’s 3000-meter steeplechase but our group was all locked in on round one of the 5000 meters. Kim needed to get a top-6 spot in her heat to move on to Sunday’s final. To our relief, she made it seem like child’s play. Our group collectively exhaled for what seemed the first time in a week and then we watched Emma Coburn handle the steeple chase final with as much ease as Kim had just experienced in her pre-lim. Defending steeplechase champ Evan Jager repeated Coburn’s performance in dominating his field of competitors. I was reminded of the great Henry Marsh of the late 70’s/early 80’s, who always hung back in last place until late in the race when he seemed to thank each competitor for their participation as he went by them on the final circuit. The women selected their Olympic trio for the 100-meter hurdles and, once again, a fresh group was doing the celebrating, led by Brianna Rollins. Unfortunately for Keni Harrison and for track fans around the world, she picked the wrong time to have a poor showing. The world’s leading hurdler coming in, she faded to sixth. Two weeks later Harrison set a new world record for the event in London. Distance running fans in the crowd were given their most memorable moment on Day 9 as they watched the men’s 5000 final unfold. Like Kim, Bernard Lagat had made an early exit from the 10,000 a week earlier and re-focused on this race. Even though he was the oldest man in the field by far, Lagat was content to settle into a very sluggish pace for the first 1000 meters. That showed his confidence that his legendary kick was still a force to be reckoned with. But then two unheralded runners decided to try to make a name for themselves. Brian Shrader bolted from the pack and was quickly joined by William Kincaid. These two turned in a sub-60-second 400 meters to gap the field by a surprising margin. Everyone else in the pack responded as if the two troublemakers were invisible. The pair ran another hard 400 and suddenly held a five-second gap that looked quite impressive from where I sat. When Paul Chelimo decided to join them at 3000 meters, the field took notice and gave chase. Two laps later the feisty duo that started the whole thing were back in 9th and 13th. But just when order appeared to be restored, the battle got bloody. On the penultimate lap the pace dropped to 62 and then the stage was set for Lagat, who appeared to be holding on for dear life back in sixth place. Four of the men just in front of him would then blister a 53-second-lap but down the final straight Lagat was still there and so was his kick. He ran a 52 to take the gold as the stadium erupted. The old man had turned back time. The hubbub surrounding the men’s 200-meter final was the fact that there were two high schoolers in the race and both had qualifying marks that made them serious threats to make the Olympic team. In the end, though, it was veteran Justin Gatlin again, never seeing another runner from his starting spot in lane eight to the finish. The HS boys were very close to realizing an unthinkable dream, taking fourth and fifth, perhaps signaling a changing of the guard for one of the best ever, Tyson Gay, who took sixth. A relative youngster did set the crowd on fire during the day’s last event, the men’s 110-meter hurdles. U. of Oregon’s own Devon Allen defended his top seed with a flawless performance over the barriers. Here we were again, nervous for Kim on a do-or-die day for achieving Olympic glory. But first we watched another group of fresh faces punch their ticket to Rio in the women’s 400 hurdles. Fun fact. Kim was not the only Montgomery High grad running in this 5000 final. Her HS teammate, Sara (Bei) Hall, a veteran of two previous Olympic Trials, had worked her way into another final at the age of 33. Hall had set her sights on the marathon this time around, and was running in the top four of the qualifying race in Los Angeles a few months ago before being forced to drop out at mile 16. She, too, had a second chance at redemption, although she faced long odds in a field of women with much faster PRs. The race featured all three of the qualifiers from the 10,000 a week earlier. Molly Huddle was again considered the class of the field and had fellow Rio teammates Emily Infeld and Marielle Hall poised to earn a spot in a second event. D’Agostino was back, more mature by four years and Katie Mackey was on a lot of lists as a favorite to make the team. There were no published previews that listed Kim Conley as one of the top three finishers. But unlike 2012, when publications did not even list her name among the candidates, this time Kim was prominently lauded as someone who would be in the mix. In the mix she was, as the crowd of runners let Infeld and Huddle set the pace. Conley remained right behind, running next to Houlihan on the outside edge of lane one, lap after lap. There was bad luck to be had back in the pack again as last year’s national champ Tully tumbled onto the infield just after the mile mark. She rose and tried to rejoin the race but made no headway on the pack. Halfway through the race Tully’s Olympic dreams officially came to an end and she walked slowly down the straightaway, tears streaking her cheeks. Drama would not return until the bell sounded for the final lap. There were six runners grouped within one second and Kim was number four. The bell was like a call to dinner for Huddle, Infeld and Houlihan. By the time she rounded the first turn Huddle was gone and Houlihan had just passed Infeld for second. The gap back to Kim was nearly four meters and the situation appeared desperate. In reality, she had Infeld right where she wanted her. D’Agostino and Marielle Hall were dropping now so it was just a matter of reeling in Infeld. Kim made quick work of it. Halfway down the backstretch she moved into Olympic position and, from my perspective far away, I could clearly see that it was a done deal. Huddle and Houlihan were not coming back, each clocking around 63 seconds for the final lap. But Kim was moving pretty well, too, putting three seconds on Infeld to finish alone in that coveted spot. The track gods had made up for their previous mischief. Kim Conley is a two-time Olympian. High Fives all around at the end of the race. – Brad Zanetti and John Harmon. 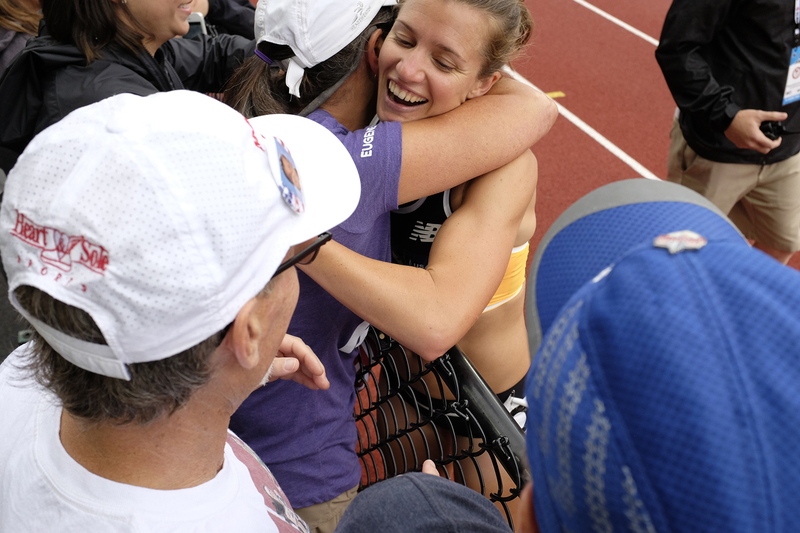 Kimmy receives a congratulatory hug from Tori Meredith during her victory lap of Hayward Field. I saw the men’s 400 final. I saw the women’s 1500 final where the form sheet played out just as written. I saw the dramatic dive that put Jennifer Prandini on the 200 team and kept Allyson Felix off it. I saw a terrific men’s 1500 where the favorites did not fail to please the crowd. But I really only remember Kim’s race and that sweet feeling of redemption.